So Much to Fit into Summer! Dinosaurs and butterflies. That’s what brought my husband, Michael, and me to the North Carolina Aquarium at Fort Fisher for the first time last year. 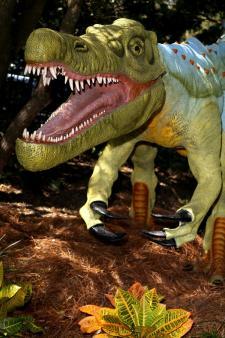 We wanted to look into the animatronic eye of a giant, prehistoric, snaggletooth lizard one moment, and feel the flutter of a thinner-than-paper wing past our cheeks the next. And these special exhibits delivered beyond expectation and are returning to the aquarium in 2018. It was one of our many trip highlights at Wilmington and its Island Beaches. The region seems to have it all: historic buildings dating back to the founding of America, museums celebrating local heritage, miles of nearby pristine sandy beaches, perfect waves for surfing, and even a World War II-era battleship, the Battleship NORTH CAROLINA. Located in southeastern North Carolina, Wilmington overlooks the Cape Fear River just before its exit into the Atlantic Ocean. Its location provides a unique combination of cosmopolitan hip neighborhoods and flip-flop-ready island beach towns; the closest of which are Wrightsville Beach, Carolina Beach and Kure Beach—all within minutes of downtown. From Memorial Day through Labor Day, Wilmington and its Island Beaches provide a wide range of pursuits for active or laidback lifestyles. We like a bit of both on vacation, so whether we wanted to check our surfing prowess or kick back, we were covered. Wrightsville Beach is the quintessential surf community; in fact, back in 1909, local Burke Bridgers pioneered surfing at the Wrightsville Beach coast. For a glimpse of an earlier version of this beach town, we stopped off at the Wrightsville Beach Museum of History. 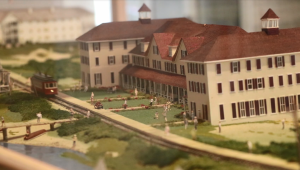 Located in the historic turn-of-the-last-century Myers Cottage, a large diorama portrays the beach at a time when visitors traveled to and from Wilmington by trolley car. The Museum expanded this year thanks to the recently relocated 1924 Ewing-Bordeaux Cottage. Non-surfers think of the sport as just a young person’s pursuit, but as people who took up surfing after we turned 50, we can attest that it’s a fun activity for multiple generations. In fact, the popular WB Surf Camp offers lessons and camps for all ages, from the very young (age 6, where they soak in ocean safety principles and even learn how to strum a ukulele) to the young at heart. There’s also a camp that caters to families looking to surf together, aptly named Family Surf Camp. Farther on down the coast, Carolina Beach is also a popular surfing destination with would-be short-boarders heading to Tony Silvagni Surf School, which even offers combined yoga and surf sessions. After a few days of fun and games on the Carolina Beach Boardwalk (and a stop at the legendary Britt’s Donut Shop), we went back to nature to search for the elusive Venus flytrap. The Wilmington area is at the heart of a 75-mile stretch that is one of the famous plant’s only natural habitats on Earth. 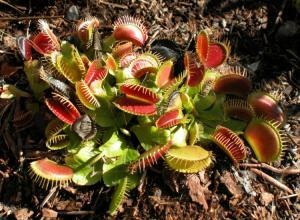 Among the many walking trails at Carolina Beach State Park is the Flytrap Trail, which offers a close-up view of the insect-eating plant. We had difficulty spotting them until we realized the entire plant is the size of your hand. The best time to explore is from mid-May through mid-June when they bloom, revealing their location. Or better yet, guided walking tours are offered on Saturdays to enhance your quest. 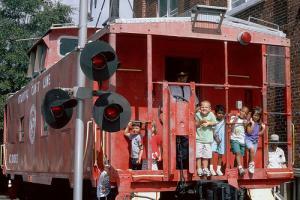 Back in downtown Wilmington, the Wilmington Railroad Museum on the Cape Fear riverfront is a great stop for kids and adults who act like kids—like Michael—when they hear the sound of a train whistle. Located in a circa-1883 brick warehouse of the Atlantic Coast Line Railroad, the museum highlights the history of railroading in North Carolina, remembering a time when meals were served on a train with fine china and silverware. There’s a Children’s Hall with hands-on toys and a model railroad set whizzing along the tracks. Adjacent to it, the Model Hall features a 1,500-square-foot model railroad that has more than a dozen active lines running. Much to Michael’s joy, the exhibit is of the “please touch” variety: the layout is punctuated with buttons that run the trains, sound the horn and more. Outside there’s also an antique steam locomotive, boxcar and caboose for kids to climb aboard. 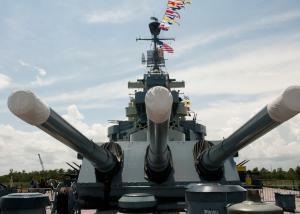 Afterward, we crossed the river to explore a sight that makes that steam locomotive look Lilliputian: the Battleship NORTH CAROLINA, the most decorated U.S. battleship of World War II. On a self-guided tour that takes about two hours, we did our best to investigate all nine decks that are open to the public, scurrying up and down ladders from the massive steam turbines deep down in the engine room all the way up to the pilot house on the bridge. Up on deck, the ship’s 16-inch guns that once pounded Iwo Jima and Okinawa now point toward the waterfront in tribute to all the sailors who served aboard the vessel’s decks. 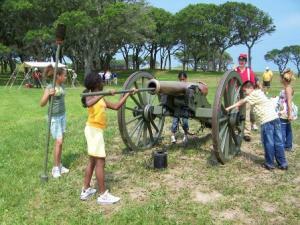 Another standout treasure was Fort Fisher State Historic Site, located at Kure Beach. Fort Fisher played a key role protecting the strategic port of Wilmington during the Civil War until it fell in battle in January 1865. We scouted the large grassy mounds of the fort that remain along with wooden palisades, while indoor and outdoor exhibits provided insight into the fierce fighting that took place here. Kids especially get excited about the displays, such as a working reconstructed seacoast cannon outside and a 16-foot-long, three-dimensional model of the scene as it was in 1865 inside. After a full week of both beachside relaxation and unique attractions, we confirmed that Wilmington and its Island Beaches has something for everyone. With so much to see and do, no two vacations here are alike, so you’ll want to come back again and again. Since we were able to take up surfing at our age, we’re now feeling plenty empowered to SCUBA dive, and there’s one special dive spot here that features a sunken Civil War vessel (North Carolina’s first Heritage Dive Site), and another that includes a search for giant, prehistoric teeth—Megalodon Ledge. It’s hard to predict what else we’ll get into next time. Kure Beach has an ever-present draw with unspoiled, back-to-basics nature. Maybe the Carolina Beach Boardwalk will capture our fancy with its contagious energy emanating from summer amusement rides, musical entertainment, shops and delighted guests. Another occasion may call for a scenic cruise, sailing excursion or guided fishing trip. Options are endless. 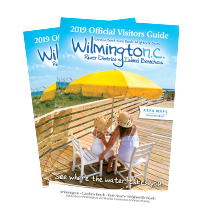 Discover so much more to do in Wilmington and Beaches!